This guide covers the install, upgrade, and removal (uninstall) procedures that you theoretically perform only once per version. This guide aims to provide you with at least some idea of what happens behind the scenes when you perform the steps. OpenIDM requires Oracle Java SE JDK 6 update 24 or later. OpenIDM services run in an OSGi container with an embedded Servlet container, and an embedded noSQL database. By default the OSGi container is Apache Felix. The default Servlet container is Jetty. For OpenIDM 2.0.3, the only supported configuration is running the services in Apache Felix and Jetty. Download OpenIDM from the download page. To run OpenIDM as a background process, see the chapter on Starting & Stopping OpenIDM in the Integrator's Guide in the Integrator's Guide. If startup was successful, all states except email and repo.jdbc are active. If any other services remain unsatisfied, check openidm/logs for errors, and refer to the chapter on Troubleshooting in the Integrator's Guide in the Integrator's Guide. OpenIDM provides RESTful access to users in the OpenIDM repository. The curl command line tool is included with most operating systems. The JSON output shown above is formatted for easier reading. OpenIDM returns the JSON object all on one line. For more information on curl, see http://curl.haxx.se/. In OpenIDM 2.0.3, the sample in openidm/samples/sample1 is configured and enabled by default. This chapter provides an overview of the sample and how it is configured. To see a listing and an overview of the rest of the samples provided see the README found in openidm/samples and in the chapter More OpenIDM Samples. Install and start OpenIDM as described in the chapter on Installing OpenIDM Services. OpenIDM comes with an internal noSQL database, OrientDB for use as the internal repository out of the box. This makes it easy to get started with OpenIDM. OrientDB is not yet supported for production use, however, so use a supported JDBC database when moving to production. If you want to query the internal noSQL database, download and unzip OrientDB 1.0. Once you have downloaded and unzipped OrientDB, you can find the shell console in the bin directory. Start OrientDB console using either console.sh or console.bat, and then connect to the running OpenIDM with the connect command. Once connected to the database, you might find the following commands useful. OpenIDM connects identity data objects held in external resources by mapping one object to another. To connect to external resources, OpenIDM uses OpenICF connectors configured for use with the external resources. When objects in one external resource change, OpenIDM determines how the changes affect other objects, and can make the changes as necessary. This sample demonstrates how OpenIDM does this by using reconciliation and synchronization. OpenIDM reconciliation compares objects in one object set to mapped objects in another object set. Reconciliation can work in write mode, where OpenIDM writes changes to affected objects, or in report mode, where OpenIDM reports on what changes would be written without making the changes. OpenIDM synchronization reflects changes in objects to any mapped objects, making changes as necessary to create or remove mapped objects and links to associate them. For a more thorough explanation of reconciliation and synchronization, the section on Types of Synchronization in the Integrator's Guide in the Integrator's Guide. This sample connects to an XML file holding sample user data. The XML file is configured as the authoritative source. In this sample, users are created in the local repository to show you how you can manage local users through the REST APIs. You can also use OpenIDM without storing managed objects for users in the local repository, instead reconciling and synchronizing objects directly through connectors to external resources. You can find configuration files for the sample under the openidm/samples/sample1/conf directory. As you review the samples, keep the following in mind. OpenIDM regularly scans for any scheduler configuration files in the openidm/conf directory. OpenIDM's reconciliation service reads the mappings and actions for the source and target users from openidm/conf/sync.json. This connector configuration file serves for the XML file resource. In this sample, this connector instance acts as the authoritative source for users. In the configuration file you can see that the xmlFilePath is set to samples/sample1/data/xmlConnectorData.xml, which contains users in XML format. For details on the OpenICF connector configuration files see the Connecting to External Resources in the Integrator's Guide chapter in the Integrator's Guide. The sample scheduler configuration file defines a reconciliation job that, if enabled by setting "enabled" : true, starts a reconciliation each minute for the mapping named systemXmlAccounts_managedUser. The mapping is defined in the configuration file, conf/sync.json. You can also start reconciliation through the REST interface. The call to the REST interface is an HTTP POST such as the following. For details on the scheduler configuration see the Scheduling Synchronization in the Integrator's Guide chapter in the Integrator's Guide. This sample configuration file defines the configuration for reconciliation and synchronization. The systemXmlAccounts_managedUser is the mapping for the reconciliation in the scheduler configuration. This entry in conf/sync.json defines the synchronization mappings between the XML file connector (source) and the local repository (target). Source and target paths starting with managed, such as managed/user, always refer to objects in the local OpenIDM repository, whereas paths starting with system, such as system/xmlfile/account, refer to connector objects, in this case the XML file connector. To filter objects from the resource for a particular target, you can use the validTarget script in the mapping to ensure only users matching specified criteria are considered part of the reconciliation. You can use an onCreate script in a mapping to set default values for a user created in the target resource. For details on scripting see the Scripting Reference in the Integrator's Guide appendix in the Integrator's Guide. For details on synchronization, reconciliation, and sync.json, see the Configuring Synchronization in the Integrator's Guide chapter in the Integrator's Guide. If OpenIDM is not running, start it as described in the procedure To Start OpenIDM Services. Reconcile the objects in the resources either by editing conf/sync.json to set "enabled" : true and then waiting until the scheduled reconciliation happens, or by using the REST interface. To see what happened, review CSV format log, openidm/audit/recon.csv. After reconciliation runs, you can use the REST interface to display all users in the local repository, by performing an HTTP GET on the following URL: http://localhost:8080/openidm/managed/user/?_query-id=query-all-ids. If you created user joe as described previously in this guide, you see IDs for two users, the second user DDOE1 created during reconcililation. Now try a RESTful GET of user DDOE1 by appending the user ID to the managed user URL, http://localhost:8080/openidm/managed/user/. In the OrientDB console, connect to the database, and then query the users and audit logs. The following shows edited excerpts from a console session querying OrientDB. 2 item(s) found. Query executed in 0.011 sec(s). 2 item(s) found. Query executed in 0.013 sec(s). 2 item(s) found. Query executed in 0.01 sec(s). Again, this information is also available in the CSV format audit logs located in the openidm/audit directory. Run reconciliation as described in the section on Running Reconciliation. After reconciliation has run, query the local repository to see the new user appear in the list of all users under http://localhost:8080/openidm/managed/user/?_query-id=query-all-ids. Also look at the reconciliation audit log, openidm/audit/recon.csv to see what took place during reconciliation. This formatted excerpt from the log covers two reconciliation runs. In the first reconciliation run (the abbreviated reconID is shown as cc0...), the source object does not exist in the target, resulting in an ABSENT situation and an action to CREATE the object in the target. The object created earlier in the target does not exist in the source, and so is IGNORED. In the second reconciliation run (the abbreviated reconID is shown as d15...) after you added a user to the source XML, OpenIDM performs an UPDATE on the user object DDOE1 that already exists in the target, in this case changing the internal ID. OpenIDM performs a CREATE on the target for the new user. OpenIDM creates the new user in the repository. If you configure a mapping to apply changes from the local repository to the XML file connector as a target, OpenAM next updates the XML file to add the new user. The current distribution of OpenIDM comes with a variety of samples in openidm/samples/. The first, openidm/samples/sample1, is installed by default, and described in the First OpenIDM Sample chapter. Each sample folder in openidm/samples/ contains a list of sub folders, such as conf/ and script/, depending on which files you need to run the sample. The easiest way to configure a new installation for one of the samples is to copy all files in the sample folder into the appropriate folder under openidm/. Some, but not all samples require additional software, such as an external LDAP server or database. Remove the pre-installed sample1 files before starting with other samples. $ cp -r samples/sample2/conf . Sample 2 resembles sample 1, but in sample 2 OpenIDM is connected to a local LDAP server. The sample has been tested with OpenDJ directory server, but it should work with any LDAPv3 compliant server. Prepare OpenIDM as described in Section 3.1.2, "Preparing OpenIDM", copying the configuration for sample 2. First start OpenIDM. Then run reconciliation over the REST interface. Successful reconciliation returns a "reconId" object. Read openidm/conf/sync.json and openidm/conf/provisioner.openicf-ldap.json to understand the layout of the user object in the repository. Prepare OpenIDM as described in Section 3.1.2, "Preparing OpenIDM". Copy the sample configuration, and copy the script to the script folder. $ cp -r samples/sample2b/conf samples/sample2b/script . If you already installed sample 2, then simply add the second mapping from sample 2b's sync.json file to the current sync.json file, and copy the sample script to the script folder. The script is referenced in the second mapping. 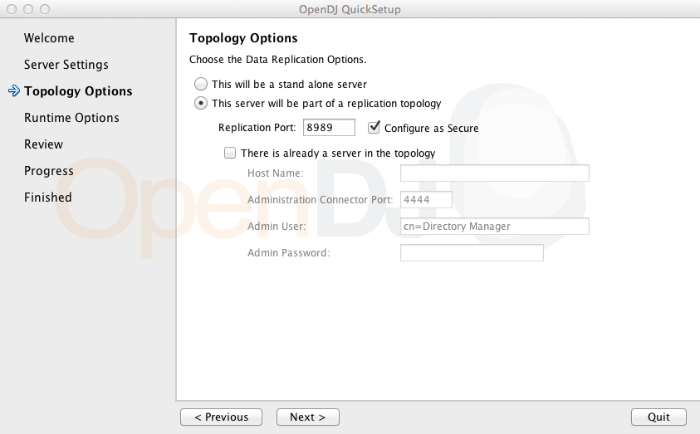 Configure the LDAP server as for sample 2, Section 3.3.2, "LDAP Server Configuration". The LDAP user must have write access to create users from OpenIDM on the LDAP server. Test the second mapping by creating a user in the OpenIDM repository. Run reconciliation again to create the new user in the LDAP server as well. Scripts are located in the openidm/samples/sample3/tools/ folder. The openidm/samples/sample3/data/ folder contains a data definition language script for setting up the MySQL database schema to hold the external user objects. Prepare OpenIDM as described in Section 3.1.2, "Preparing OpenIDM". Copy the conf and tools folders. $ cp -r samples/sample3/conf samples/sample3/tools . In conf/provisioner.openicf-scriptedsql.json, edit the paths starting with /opt/111 to match your installation. You do not need to copy the sample3/data/ folder, as its content is needed only to set up the external user database. In this example OpenIDM communicates with MySQL database server. OpenIDM requires a MySQL driver, the MySQL Connector/J. Download MySQL Connector/J, unpack the delivery, and copy the .jar into the openidm/bundle directory. Make sure MySQL is running, and then restart OpenIDM to make sure the Connector/J bundle is picked up. If the configuration of the external database is correct, then OpenIDM should show five users during startup. The check method, executed for each connected resource, executes a select * from Users statement. The sample 3 sync.json configuration file contains a mapping to reconcile OpenIDM and the external databasee. Run the reconciliation with the following command. Prepare OpenIDM as described in Section 3.1.2, "Preparing OpenIDM". Copy the configuration, and copy the data folder holding the .csv file. $ cp -r samples/sample4/conf samples/sample4/data . The only external resource you need is the data/hr.csv file you copied. Start up OpenIDM before running the sample if you have not already done so. $ cp -r samples/sample5/conf samples/sample5/script . No extra external resource needs configuration for this example. The XML files used are located in the openidm/samples/sample5/data/ folder. When you start OpenIDM with the sample 5 configuration, it creates xml_AD_Data.xml, which does not contain users until you run reconciliation. Sample 6 resembles sample 5, but sample 6 uses two real LDAP connections. To simplify setup, both provisioners point to the same LDAP server, and only use different base DNs, so you can simulate use of two directory servers with a single OpenDJ directory server, for example. Prepare OpenIDM as described in Section 3.1.2, "Preparing OpenIDM". Copy the configuration for sample 6. $ cp -r samples/sample6/conf . Out of the box, the sample provisioners are configured to use two independent LDAP servers. Change the sample to connect to a single LDAP server representing both external resources by using the same port numbers in both provisioner .json files. For example, change conf/provisioner.openicf-ad.json so the port number line reads "port" : 1389. With LiveSync, OpenIDM detects changes in an external resource as they happen. OpenIDM detects changes in OpenDJ by reading the External Change Log (ECL). The ECL is presented as an LDAP subtree with base DN cn=changelog. Each change is represented as an entry in the subtree. Each change entry remains in the subtree until the log is purged (by default three days). You turn on the change log in OpenDJ by enabling replication. OpenDJ provides the change log even if it does not in fact replicate data to another OpenDJ server (though it can log, in this case, harmless error messages because it is not connected to another replica). To enable replication without another server, set up replication when installing OpenDJ. Sample 6 is configuration for an external LDAP server set up as follows. The LDAP server "AD" listens on port 4389. Change this to 1389 to use a single LDAP server. The LDAP server both have a user with DN cn=Directory Manager and password password who can read and write to the data and read the change log. Prepare the LDAP server by creating two base DNs, dc=example,dc=com and o=AD, and then importing the following objects. The following sections show how to run the sample both once with reconciliation, and continuously with LiveSync. Start up OpenIDM, and then run reconciliation. The result of a successful reconciliation is a reconId object. With the configuration for sample 6, OpenIDM creates user objects from LDAP in the repository, and also in the target AD suffix. After reconciliation, list all users. You can also view users created in the AD suffix with the following ldapsearch command, assuming you changed the port number to 1389. In contrast to reconciliation, which you can start by using a scheduler configuration or by using the REST interface directly, you must start LiveSync using a scheduler. The sample comes with the following scheduler configuration file for LiveSync in conf/scheduler-activeSynchroniser_systemLdapAccount.json. Activated LiveSync by editing the file, conf/scheduler-activeSynchroniser_systemLdapAccount.json, to change the "enabled" property value to true. With LiveSync enabled, you can change LDAP users and see them show up in AD as OpenIDM flows the data between resources dynamically. By default OpenIDM uses OrientDB for its internal repository so that you do not have to install a database in order to evaluate OpenIDM. Before using OpenIDM in production, you must however replace OrientDB. OpenIDM 2.0.3 supports use of MySQL as an internal repository. After installing MySQL on the local host and before starting OpenIDM for the first time, perform the following steps. Download MySQL Connector/J, unpack the delivery, and copy the .jar into the openidm/bundle directory. This step creates an openidm database for use as the internal repository. (Optional) Optionally protect access to the openidm database by creating a specific user and granting that user all privileges to update the database. Update openidm/conf/repo.jdbc.json as necessary, especially the login and password parameters if you have created a specific user for OpenIDM. After setting up MySQL for use as the OpenIDM internal repository, you can start OpenIDM. After startup, you should see that repo.jdbc is active, whereas repo.orientdb is unsatisfied. This chapter shows you how to uninstall OpenIDM software.